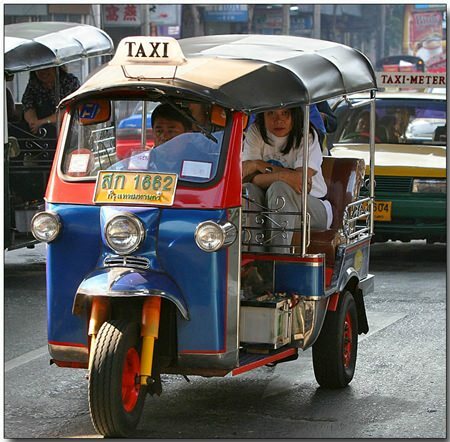 One of the unofficial national symbols of Thailand is the noisy three wheeled vehicle known just as Tuk-Tuk. In fact, driving a Tuk-Tuk is an occupation reserved for Thais, as for some reason not known to or discussed with me, Thai officialdom has deemed this so. One of the other protected professions is that of a shoe cleaner. Not that I believe there would ever be a long list of applicants from overseas for these plum jobs! The history of the Tuk-Tuk apparently dates back to 1871, when King Rama V of Thailand was presented with the first ever rickshaw in the Thai capital by a wealthy Chinese resident. The idea caught on immediately due to Bangkok’s narrow, muddy streets and the expense of owning horse drawn buggies. The next development was the ‘Samlor’, which literally means Three Wheels and had the driver up front astride the bicycle part of the contraption, and the cab section at the rear which had two wheels and took the passengers and goods. In the 1950’s the Samlor was outlawed and banned from Bangkok’s streets, as a faster, motorized vehicle was needed, though the original Samlors can still be found in country areas of Thailand. The internal combustion engined samlor was the next development, which being a two-stroke made the noise “tuk-tuk-tuk-tuk” on the over-run and the motorized three wheeled device then became known as the “Tuk-Tuk”, and is now synonymous with Thailand. However, I have to report that despite the official decree I have not just driven a Tuk-Tuk, but I have owned two of them as well. Am I then a criminal, not being a native Thai? Fortunately no, because my Tuk-Tuks were imported into Australia, with one coming from Thailand and the other from Italy! Italy? Yes, Italy. Despite what you might read, Tuk-Tuks are found in many countries, not just Thailand. However, despite claiming I am not a criminal, I do admit to being a risk-taker. Not the risk of being charged with illegal driving by the Thai authorities, but the risk inherent in just driving the things! Like all the best laid plans of mice and men (though I am not convinced that mice plan anything), I had forgotten one important factor – the Australian government’s vehicle registration regulations. The regulations did not cover Tuk-Tuks, so my delivery vehicle couldn’t be registered. The initial negative response was followed by around six months of negotiations where government engineers put forward suggestions to make the Tuk-Tuk more likely to be registered Down-under. The first modification was to fit a front brake, and this was fairly simple to do, using a motorcycle disc brake and caliper. Next was the requirement to raise the roof by 5 cm. I have no idea why, but maybe they were working on the principle that Aussies are taller than Thais, so more head room was necessary. This was done easily and we were looking good. A provisional registration plate was issued and my “legal” Tuk-Tuk was delivered to the restaurant where it was another static display.